Travis Perkins faces decline in "challenging period"
Wickes parent company Travis Perkins plc has today announced its half year results for the six months ended 30 June 2018. The company reported a revenue growth of 4.4% with like-for-like growth of 4.2%. Good trading performance in the trade focused businesses in General Merchanting, Plumbing & Heating, Contracts and Toolstation. However Travis Perkins has said a "challenging UK DIY market" has negatively impacting sales and profitability in Wickes, with significant cost reduction plans underway. Cost reduction plans in progress across the Group with benefits weighted towards H2 2018. Adjusted operating profits decline of 5.8% primarily reflects sales mix, with weaker Kitchen and Bathroom showroom sales in Wickes, and higher operating costs in General Merchanting. Travis Perkins has warned its full year profits will be in the lower range of the half range of analyst expectations, as the company takes a hit from Wickes' underperformance during a challenging market. Chief Executive Officer, John Carter said: “Our trade focused businesses in General Merchanting, Contracts, Toolstation and Plumbing & Heating achieved good sales growth despite experiencing a volatile first half. These businesses exited the period with encouraging momentum and, supported by a continued focus on cost, they remain on track to deliver modest profit growth for the full year. Our consumer-focused business, Wickes, has had a far more challenging period as weaker consumer spending trends, combined with a difficult competitive environment, have held back profitability. 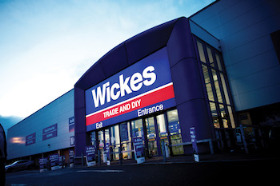 Consequently, the Wickes team is executing a significant cost reduction programme. Whilst these savings will help drive improved profitability through the second half of the year, Wickes’ profits will be lower than previously expected. Mr Carter also noticed declining consumer confidence in Travis Perkins' 2017 full year results. The sales trend in Toolstation through the first half of the year was similar to the other trade focussed businesses, with a good start to the year, a weak period in March and April, and strong recovery thereafter. Even with the disruptive backdrop, Toolstation achieved another strong performance with total sales growth of 17.6%, and 10.7% on a like-for-like basis. Sales growth was driven by the continued growth of the store network in the UK, with 22 new stores opened in the half taking the total network to 317. The rollout will continue at pace in the second half. Improvements to the proposition are also driving higher sales density, with front-of-counter consumables, range improvements focused on trade customers and additional online range extension and the roll out of “drop-ship” delivery direct from suppliers. The expansion of the Toolstation Europe network continued with further stores in the Netherlands and an extension of the trial in France, with encouraging sales results. "The UK DIY market continues to be challenging" said Travis Perkins, and was badly affected by the inclement weather in March and April. Wickes did not recover as strongly as the trade focused businesses, with consumer sentiment remaining subdued. Whilst core DIY sales recovered modestly, helped by the business’s exposure to small trade customers, K&B showroom sales have proven to be weaker, which has significantly impacted sales and profitability. Wickes’ sales declined by 5.8% in the first half of the year, and by 7.7% on a like-for-like basis. Gross margin was diluted as input cost inflation could not be recovered through pricing due to competitive pressures and an adverse sales mix in the period. Adjusted operating profit declined by £14m. As described in note 2 and 12, the Group has recognised an impairment of £246m in relation to goodwill. In response to the challenging market conditions, the Wickes team has implemented a comprehensive cost reduction plan, building on the activities carried out in Q4 2017. As a direct consequence of these actions the overhead cost base was £9m lower in H1 2018 compared to H1 2017, with further benefits to be realised in the second half of the year which are expected to underpin an improved profit trend. Shrinkage has been reduced by 25% by applying an end-to-end focus on the supply chain, branch staffing levels are being carefully controlled to match trading volumes, and a significant restructuring was carried out in the head office functions in May, reducing headcount by a third.